The reason that The Darkness’ Permission To Land was so successful wasn’t because the mid-2000s was crying out for a glam-metal revival, but mainly because in terms of satirising that exact style, that album did it almost perfectly. It also meant that The Darkness would set themselves for the monumental fall they would go on to experience, overtaken by Steel Panther’s bawdier, less-old-fashioned take on comedy and bogging themselves down with a couple of really lacklustre post-reunion albums. The silver lining is that at least the burden of expectation is no longer an issue, something that seems to have been realised on Pinewood Smile. Their fifth album feels like The Darkness trying to recapture the vibe that made Permission To Land such a force by placing a greater emphasis on humour again, and while this does prove to be the weakest link in the end, this is easily the best album The Darkness have come out with in some time. What makes that the case is that, compared to a band like Steel Panther whose attempts at parody come with a wholesale replica of the hair-metal sound, The Darkness may ground themselves in the general area, but show themselves to have the versatility as performers to step above being just the parody; there is actual musical talent here that The Darkness are more than happy to flaunt. The metal riff that kicks off Japanese Prisoner Of Love is the sort of slap to the face that this band have never even hinted that they’re capable of, while the nautical-themed gallop of Buccaneers Of Hispaniola and the AC/DC-esque stomp of Solid Gold portray a band at the most fiery that they’ve been in a long time. On the other side of the coin, though, some of the more pared-back cuts like Lay Down With Me, Barbara and Happiness aren’t as impressive and kind of feel like a band spinning its wheels with material that they could more or less nail in their sleep, but there’s no denying that Pinewood Smile is a bit more diverse that most satirical acts, and there’s been a clear amount of effort put in to make that so. That effort is what keeps Pinewood Smile on steady ground as a whole, not just relying on its humour to make an impact but factoring in instrumental chops alongside that as well. It’s that sort of work put in that gives this sort of band a bit more leeway if the humour doesn’t always stick the landing which, in the case of Pinewood Smile, is very fortunate indeed. As ever, The Darkness favour a more British approach to comedy than their cousins over the pond, with wryness and wit replacing much of the broad bro-comedy that gets really old really fast. It’s why Solid Gold is the best song here, the sort of snarky jibes at the music industry from a band who’s seen it all and knows exactly what it’s like on the inside. This sort of approach does have a shelf life – Justin Hawkins’ self-deprecation all across All The Pretty Girls and Why Don’t The Beautiful Cry aren’t saved from repetitiveness by being as endearing as they admittedly are – but there’s enough put into the whole package to make up for when flagging becomes an issue. Some of this is really beyond help though, particularly when The Darkness draw from a well of comedy that feels outdated or unnecessarily below the belt, like I Wish I Was In Heaven which is a particularly dull “rock is dead” number that really can’t even get itself off the ground, or especially Stampede Of Love which constitutes a pileup of fat jokes that couldn’t feel in worse taste. It puts a dampener on an album that already has a number of issues, but solidifies the fact that Pinewood Smile comes from a band who are unequivocally from another time that doesn’t translate well nowadays. Even so, after so many years of falling below par in such spectacular fashion, this is at least a marginal improvement. Rarely are The Darkness that much of long-lasting act in terms of their material, but the fact that Pinewood Smile has a couple of tracks worth revisiting at least puts it slightly ahead of its predecessors. Ultimately, this album reveals that listening to The Darkness in 2017 is a bit like watching a Carry On film – it hasn’t aged particularly well, it leaves something of a bad taste in the mouth, but there’s at least some enjoyment to be gleaned from it regardless. 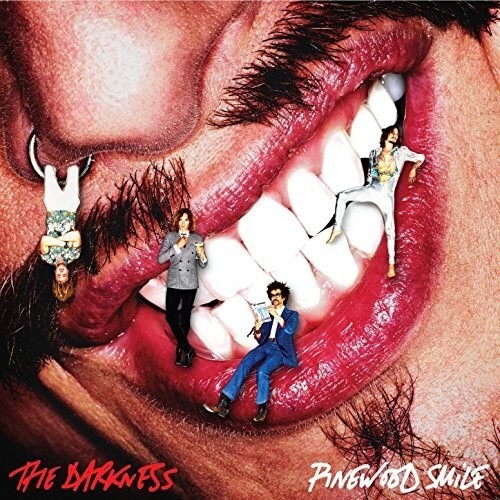 ‘Pinewood Smile’ by The Darkness is released on 6th October on Cooking Vinyl Limited. Particularly back-handed review here. Heavily pointing out that this band is purely a guilty pleasure. The result is you either like these guys or you don’t. Why confuse people? They’re all about fun and satire. Do we really need a highbrow take on their modus aperendi? This said.. I prefer them toned down a tad like the last two albums. This is them back at their most whacky,Justin’s falsetto back in full swing like the first two releases. They may not be as complicated as Queen most times,but the guitars are DEF in the ‘Thank You Brian May’ category,as usual–great stuff! And–they certainly are quite a far notch above their other main influence,AC/DC. In any event– if this sells well for them,then it only means to say that people have gotten accustomed to their wackiness by now. Anyone who loved Permission To Land will adore this ‘return to form’. As well as those who got comfy with them after the fact. The haters will still abhor them and not get it. But then…they never were for every rock fan.